Born in Somerset East, Jenny has lived in Durban since she was 12 and attended Girls’ High School. 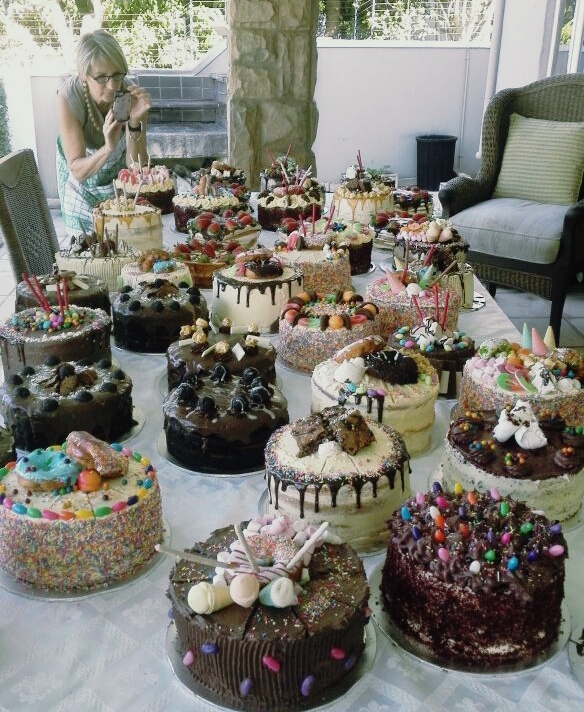 She began baking when her kids started school and she was asked to contribute cakes to school events. “This was when I realised I could bake” she says. Soon she was filling orders and supplying Something Special, a home industries outlet in Greyville, baking from home. Then she was asked by the then proprietors of Antique Cafe to open a tiny bakery there. She supplied the cafe, outside customers, as well as Something Special, for something like 15 years. But she yearned to expand and open a commercial kitchen, but was hesitant about taking the plunge. Could she afford it, she asked herself? “I had seen these premises and just knew I had to have this place, so I asked Claire to come in with me. We both come from existing businesses and this way we could split the rent” says Jenny. The idea of also setting up a coffee shop was an instinctive one. 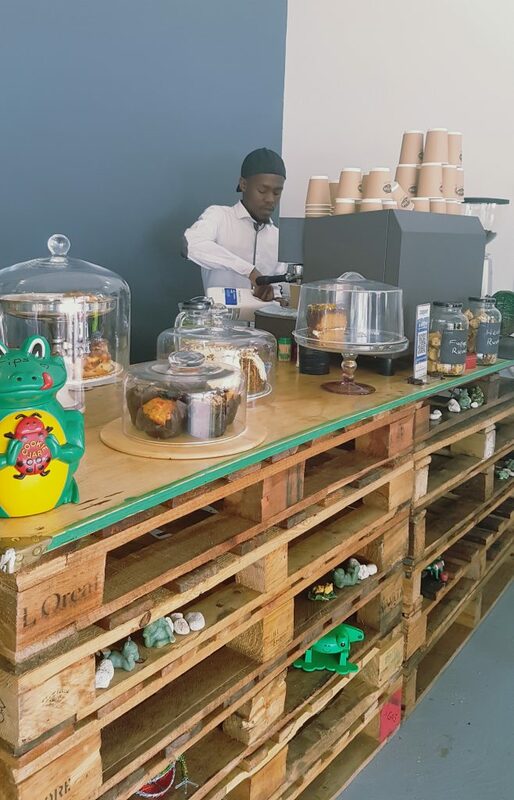 The decor is still a work in progress, but there’s a warm friendly vibe there – filled with the aroma of baking and grinding coffee – and fat frogs. The Fat Frog concept came about when she and one of her sons were discussing what name to give her bakery. She came up with the Blind Baker (Jenny has very poor eyesight). Happily, her son came up with something less concerning. “I have been collecting frogs for years, something my kids were always aware of.” Thus the Fat Frog was born and the premises are well stocked with frogs squatting on shelves, and on the counter. They are friendly-l00king frogs, smiling benignly over the coffee making and cake eating. Ironically, Jenny does not particularly have a sweet tooth. “Although I am a sucker for hot cakes or muffins just out of the oven” she says, handing me a freshly baked hot olive muffin to sample. Her most popular cake is still the bee-sting, two layers of cake filled with creamy custard and topped with a caramel and nut topping. It’s truly ambrosial – and difficult to bake as it happens. Many have asked Jenny for the recipe, but the usually chatty and vivacious Jenny keeps mum on this one. I tell her I think I’ve worked out how she makes it and explain my theory. Jenny just smiles enigmatically. But of course there is also her lemon and orange velvet cakes, which I love, her chocolate ganache cake and her candied orange cake. 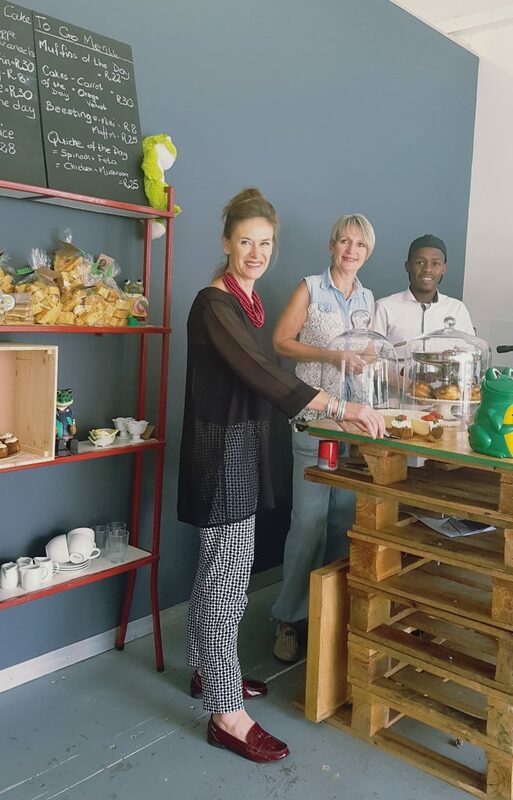 Her kitchen also produces rusks, muffins (sweet and savoury) biscotti, butter biscuits, mini milk tarts, carrot cakes and hummingbird cakes (with pineapple). Her cheesecakes are pretty famous, too, and she describes her bar-one cheesecake as “unbelievably good and not too sweet”. I remind her about her bee-sting shortbread, which is traditional shortbread topped with a caramel and nut topping. Totally hard to resist once you start eating them. Now she has a bigger kitchen she has chance to experiment and add to her range. She’s looking forward to that, she says. Then another customer comes into the shop, spots Jenny and makes a beeline for her, smiling broadly. “Jenny” she calls out enthusiastically. At this point I give up on the interview. Although Claire did a year’s cooking course with Christina Martin her earlier years were spent bringing up her kids. Then she started home catering (from home) on small scale. She also offered cooking classes before focusing on frozen and fresh meals for takeaway. After building up a solid client base there was only one way to go – and that was bigger. And this is exactly what the Fat Frog Kitchen will allow her. She makes the likes of beef lasagne, oxtail, lamb curry, chicken lasagne, lentil and mushroom moussaka, pasta dishes, cous-cous salad and fresh meals of the day.